Portrait of handsome child with gift box. Lovely boy pointing with finger on gift box in his hand on abstract blurred background. Caucasian businessman holding gift box. Stylish mature man in suit pointing with finger on gift box against blurred background. Pretty woman with gift box on palm. Portrait of young beautiful woman pointing with finger on present box, gray background. 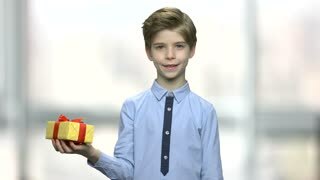 Boy with gift box on blurred background. Handsome child in stylish shirt pointing with finger on present box. Special Birthday offer. Little boy holding large gift box. Stylish little boy pointing with finger on gift box in his hand. Get holiday bonus concept.